Lance Clifford has co-drove for Roger in the past including iron-manning the Baja 1000. The third seat in pre-running this week is reserved for Tim Nugent, the motorcycle rider that was struck by Norman during the Baja 500, who has made a full recovery. “Roger and Lance work really well together, and I see how the coordination is important. I didn’t realize there was so much that goes into marking course because on a motorcycle we are just picking lines, not able to have two sets of eyes including one on the GPS,” commented Tim Nugent. “It has been rewarding being in the middle seat, I can see both sides of what Roger and Lance are seeing.” Nugent will co-drive for the last 140 or so miles of the race. The team will be available during Contingency in Ensenada, Baja on Friday June 3rd at the Telnor booth from 12:30pm to 2pm signing posters next to the #8 Crystal Bay Casino Trophy Truck display. No matter what the finishing time or place, it is a guarantee that you will see this team up on top of the Crystal Bay Casino #8 Trophy Truck celebrating Tim Nugent’s full recovery! 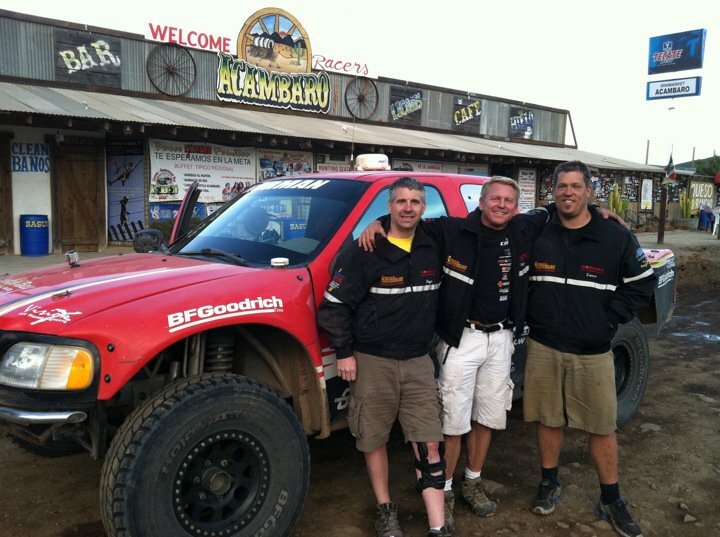 “Tim Nugent is the only thing tougher than my BFGoodrich Tires in Baja! He is the motorcycle rider hit at last years Baja 500, who over the last 11 months has successfully recovered from 23 broken bones,” said Roger Norman.